Secluded beautiful mountan home just minutes from downtown Breckenridge and ski resort! This large 6 Bedroom, 5.5 Bathroom home will comfortably fit multiple families or a large group. 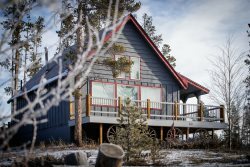 Located just one mile north of Breckenridge, it sits in a quiet yet convenient neighborhood. The kitchen is equipped with granite countertops, two sinks and all cooking supplies with plenty of seating space to enjoy meals. There is also desk space in the kitchen for those who need to catch up on work. The cozy living room has a wood-burning fireplace sure to provide plenty of heat in the cold winter months. Enjoy views on the large back patio or master bedroom suite. The master suite also has a large ensuite complete with shower and jetted tub. The furniture in the home has also been updated for winter rentals. Enjoy easy access to Main St. Breckenridge and skiing at Breckenridge Resort with one complimentary parking spot at the Park Avenue Parking Garage. Kristen is extremely knowledgeable in the areas of property management and customer service. She takes the time necessary to make sure your stay is confortable and stress free. I have stayed at many vrbo.com homes and this was the best experience.